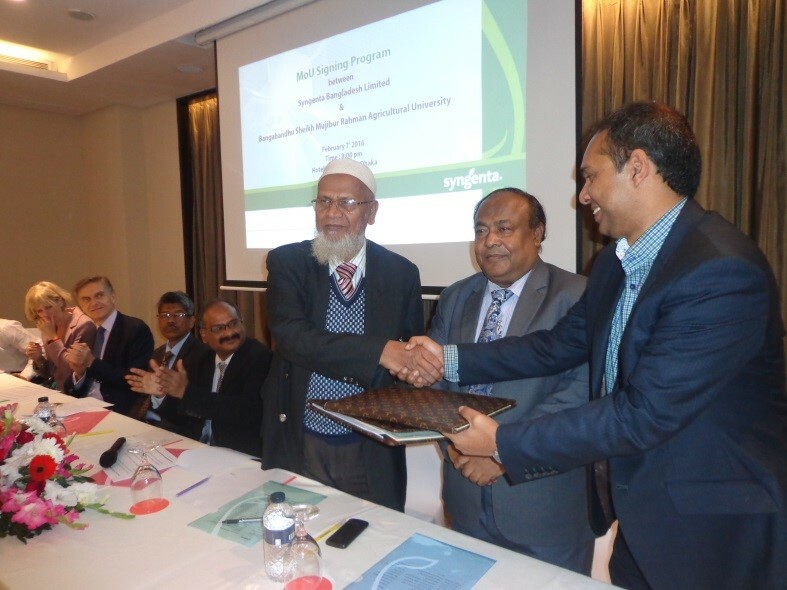 Dhaka, Feb 7, 2016: To provide an impetus to agricultural research and extension initiatives, Bangabandhu Sheikh Mujibur Rahman Agricultural University (BSMRAU) on Sunday signed a Memorandum of Understanding (MoU) with the leading agri business company Syngenta Bangladesh Limited (SBL). Syngenta’s top leadership including its global Chief Operating Officer DavorPisk, Regional Director (APAC) Tina Lawton and South Asia Territory Head BipinSolanki were present at the occasion, along with other Syngenta officials. “This MoU is aimed at exploring joint research and extension initiatives towards supporting productivity enhancement of farmers as well as ensuring sustainable food security of Bangladesh,” said DrMahbubur Rahman, Vice Chancellor, BSMRAU. Under the pact, BSMRAU will share technical know-how and mutual access to facilities, research farms and equipment and support personnel on mutually acceptable terms and conditions. The MoU will also allow the two organizations to partner for identifying and developing superior crop varieties and agro techniques. BSMRAU is a government-financed, public university of Bangladesh. It is located at Salna, Gazipur. Lauding Syngenta, Vice Chancellor DrMahbubur Rahman and other dignitaries hoped that this collaboration would go a long way in addressing emerging challenges like climate change and sustainable food security issues. The MoU signing ceremony was attended by Director General of Department of Agriculture Extension (DAE), Md. Hamidur Rahman, Director General of Bangladesh Rice Research Institute (BRRI) Dr. Jibon Krishna Biswas, Director Research of BRRI, Dr. Ansar Ali, Director, Research of BARI, Dr. Jalal Uddin, Member Director of BARC, Dr. Sultan Ahmed, all Dean of BSMRAU, Director research, Director Outreach, Director, student welfare of BSMRAU. The participants also contributed to an interactive session aimed at developing a precise activity plan for this new public-private partnership. Syngenta Bangladesh Limited already has existing MoUs with organizations like Bangladesh Rice Research Institute (BRRI), Bangladesh Agricultural Research Institute (BARI) and Department of Agricultural Extension (DAE) among others.